Van 22 tot 25 april 2013 heeft voor het eerst een delegatie van de Europese Armeniërs samen met Europese anti-racisme organisaties deelgenomen aan de herdenkingen van de Armeense genocide in Istanbul. De activiteiten werden georganiseerd door de Turkse organisatie “Stop racisme en nationalisme” (DurDe) en de Turkse mensenrechten organisatie IHD. De Europese delegatie bestond uit leden van de European Grassroots Antiracist Movement (EGAM), SOS Racisme en AGBU-Europa. Ook waren vertegenwoordigers van de FAON aanwezig, die door AGBU-Europa waren uitgenodigd om deel uit te maken van de Armeense delegatie. Bijgevoegd treft u aan de reeds door velen onderschreven verklaring in het Engels, behorend bij dit initatief. Presentatie Mato Hakhverdian (voorzitter FAON) over zijn ervaringen in Istanbul, gesprekken en kontakten van de Europese delegatie met de Turkse maatschappelijke organisaties, gelegenheid tot vragen stellen. 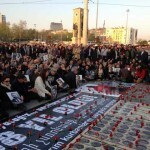 From 22 to 25 April 2013 for the first time a delegation of European Armenians together with European anti-racist organisations participated in the commemorations of Armenian Genocide in Istanbul. 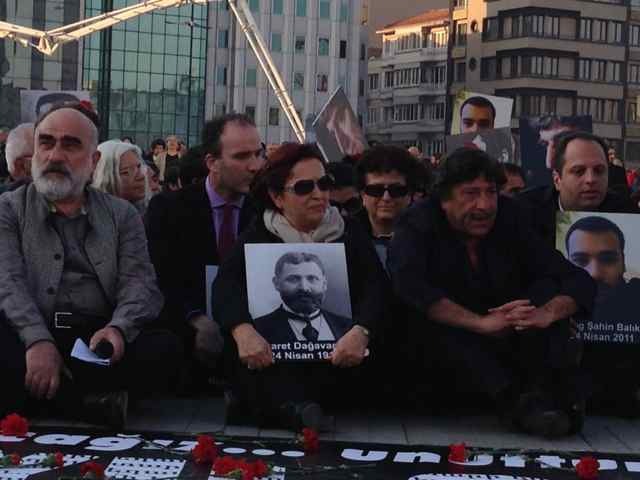 The commemoration events were organised by the Turkish organisation “Stop the racism and nationalism” (DurDe) and Turkish Human Rights Association IHD. The European delegation consisted of members of European Grassroots Anti-Racist Movement (EGAM), SOS Racisme and AGBU Europe. Representatives of the FAON were present, as invited by AGBU Europe to be a part of the Armenian delegation. Below the common declaration on the basis of this initiative, already supported by many people. It has been 98 years since, following a premeditated plan with a methodic implementation, one million and a half Armenians were massacred in the Ottoman Empire. The Armenian people were the victims of a genocide which would soon serve as a gruesome reference for those that followed. Today in Turkey, the mere enunciation of this historical fact still provokes ferocious opposition, sometimes even physical threats, and genocide denial serves as an encouragement to racism and hate against Armenians and other non-Muslim minorities. Some want to make believe that acknowledging the reality of the Armenian Genocide is an attack on all Turkish people and on “Turkishness”, whereas it is an attack on genocide denial and a step towards justice and democracy. 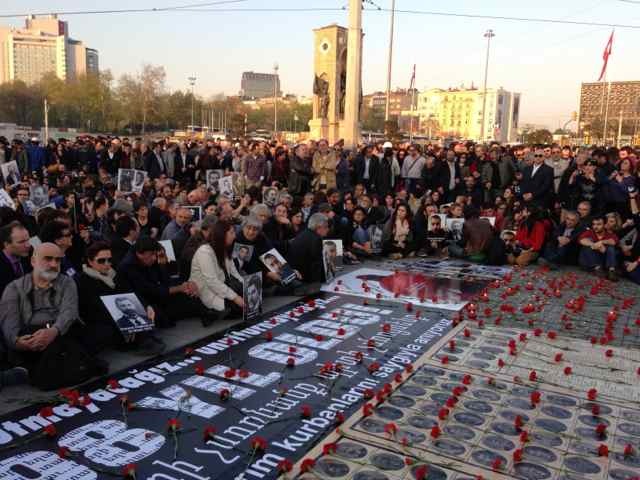 For several years now, the genocide of Armenians, which is part of world History, is being commemorated in Turkey. 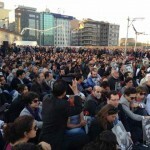 The participants are still few but their number grows every day despite an official discourse of genocide-denial. 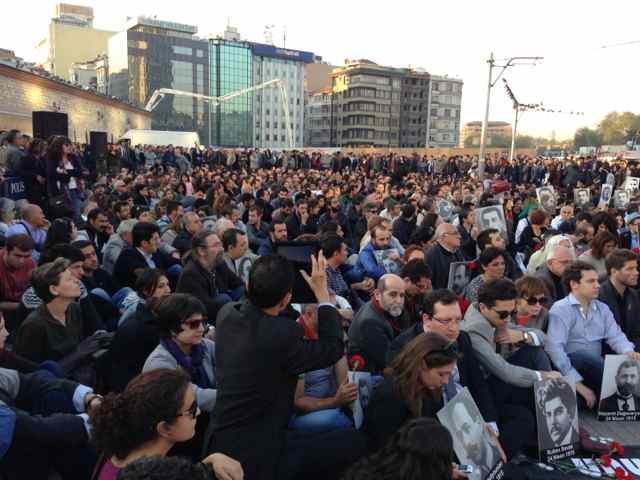 Today, those among us who have been commemorating in Turkey are calling for solidarity beyond borders. This is the reason why this year, all together, from Turkey and elsewhere in Europe, involved citizens, civil society leaders, antiracist activists, intellectuals and artists, of Armenian and other diverse origins yet unified by the desire to see this historical fact finally recognized, we will commemorate, in Turkey, on this April 24th, the unfortunate 98th anniversary of the Armenian Genocide. Our shared initiative is one of solidarity, of justice, and of democracy. It is an initiative of solidarity between all who fight for historical truth. Today the divide is not between Turks and Armenians, but between those who struggle for the recognition of the Armenian Genocide, whatever their origins are and wherever they live, and those who promote denial, whoever and wherever they are. In a word, it is not a question of blood, but of ideas, not a question of origins but of a common goal. It is an initiative of justice. In the words of Elie Wiesel, “Genocide kills twice, the second time by silence.” Denial, then, is the perpetuation of genocide. Fighting against denial is trying to quell the trauma in Armenian communities from one generation to another. It is not an end to this part of history – because when it comes to genocide, there is unfortunately no true end – but it offers new generations the opportunity to look together towards the future. Finally, it is an initiative for democracy. Echoing Jorge Semprun’s frequent reminder, democracy requires vitality from civil society. Strengthening Turkish civil society by establishing bridges with the rest of the European civil society is strengthening democratic values, thus combating racism and promoting human rights, in Turkey as well as in the rest of Europe. In solidarity, for justice and democracy, for the respect of the victims and their descendents, we will commemorate together the Armenian Genocide this April 24th, in Turkey, or support these who will do so. Benjamin Abtan, President of the European Grassroots Antiracist Movement – EGAM, Cengiz Algan & Levent Sensever, Spokespeople for Durde! 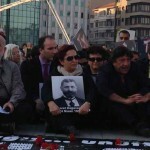 (Turkey), Alexis Govciyan , European President & Nicolas Tavitian, Member of the Board of the Armenian General Benevolent Union – AGBU (Europe), Meral Çildir, Member of the Board of Directors & Ayse Gunaysu, Member of the Commission against Racism and Discrimination of the Turkish Association for Human Rights – IHD (Turkey) and others.